I had some fancy (well maybe not fancy…expensive?) cheese left over from another meal I made, so I decided to throw this together and it turned out to be very delicious. It passed the taste test of my number one fan and my number one critic…my hubby! I’m hopeful this will please your taste buds as much as it did for ours! First off, I want to say that this recipe is what I like to call a great “base recipe”. By this I mean, it has all the main things you need to get started, but it is easily adapted to fit your own preferences as well as your own creativity. With this recipe, the possibilities are endless as you can use different types of meats, cheeses, sauces, spices, and so on….of course you may not want to call it a “steak roll up” if you’re using chicken, but you get the point. Also, if you need it for a quick meal you can substitute using refrigerated pizza dough, pre-made pizza sauce in a jar, regular shredded mozzarella, and if you are brave enough…steak-ums (do they even still make those? Are they even really beef? Ok, ok…I like steak-ums, but I won’t cook with them!). If you want to make a more all natural meal and have more time (and it fits your budget) you can make your own pizza sauce with fresh tomatoes, herbs & spices, and fresh garlic and can get a better cut of steak at your local butcher, just ask them to slice it super-duper thin! Our local farmer’s market sells two versions of their chip steak: regular bottom round and prime rib; and of course, you can use whatever cheese you like…there are so many great unprocessed cheeses out there! The version I have provided is a mixture of both (pizza dough from scratch, sauce from canned tomato sauce & paste, dried herbs, minced garlic from a jar, and basic bottom round cut of meat and some good cheese). Even if you are a beginner cook, you have probably heard or read somewhere that the best food comes from the best ingredients. I have to say that this is absolutely true! That $100 truffle you just splurged on…absolutely tastes like one hundred dollars…worth every penny! But realistically the average Jane (or Joe) probably can’t afford the very best all the time, so my advice is to always get the very best that you can afford. I usually splurge once a week and make a meal with better ingredients than I normally would for everyday cooking. This is a nice way to have “date night in”….the food is as good or better than a restaurant and it is actually cheaper than going out. So however you decide to make this recipe it will taste good…and that is the main thing, right? Make the sauce: Mix all ingredients together in a bowl. Allow to sit for 20-30 minutes. Prepare the meat by sprinkling the salt, pepper, garlic powder, and onion powder on both sides. In a skillet over medium heat, cook the steak, chopping into smaller pieces, approximately 5 minutes. Divide pizza dough in half. On a lightly floured surface, roll out the dough into two rectangular pieces. Spread about ½ cup of pizza sauce (more or less to taste) on each rectangle. 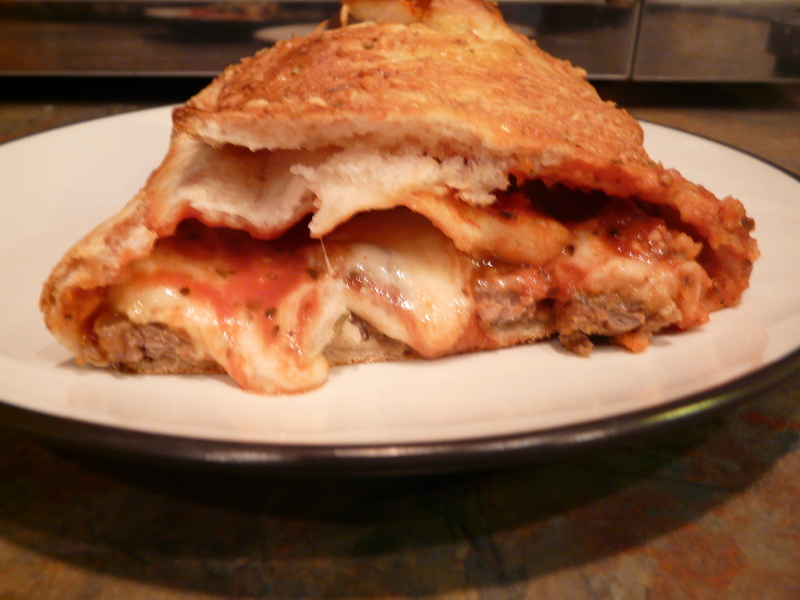 Divide the meat in half and spread out on the both pieces of dough. If you desire, add more sauce on top of the meat. Using a cheese grater, grate the fontina cheese evenly over both pieces of dough. Then, place the mozzarella pieces evenly over each piece. Roll up each piece by first folding in the two end pieces and rolling over. Seal with a fork and poke a few holes in the top. Coat the top of the rolls with the beaten egg and sprinkle with the parmesan cheese. Bake in the preheated oven for 15-20 minutes, until golden brown and heated through.